3-POINT WEDGE BEAM CONNECTION FOR STRENGTH & RIGIDITYINCLUDES BEAM LOCK. STRUCTURAL CHANNEL UPRIGHTS AND BEAMS HAVE UP TO SIX TIMES THE STEEL THICKNESS AT CORNERS THAN STANDARD ROLL-FORMED SECTIONS MAKING THEM MORE RESISTANT TO DAMAGE FROM OUTSIDE IMPACT. 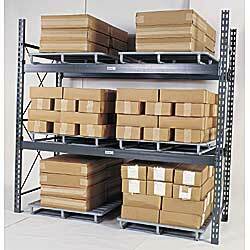 Structural steel racks feature up to six times more metal thickness at the corners than roll-formed racks. Upright frames and beams are constructed of all-welded, structural steel. Structural channels and beams offer maximum strength in the corners and sides for increased support. Three-point wedge, boltless beam connector with integral lock allows for fast, easy assembly and greater strength and rigidity. Beams adjust on 2-1/2" centers. Base plates are welded to uprights. All components are designed and manufactured in strict accordance with the Rack Manufacturers Institute (RMI) and the American Institute of Steel Construction (AISC). SELECTED MODELS FACTORY QUICK SHIP. All FOB ILLINOIS. *One required per pair of beams. XS-1684 38	 4,350	 4,350	 3"	 96"
XS-1685 43	 3,580	 3,580	 3"	 108"
XS-1686 47	 2,900	 2,900	 3"	 120"
XS-1687 45	 9,600	 9,600	 4"	 96"
XS-1688 51	 8,310	 8,310	 4"	 108"
XS-1689 56	 6,730	 6,730	 4"	 120"
XS-1690 63	 9,600	 9,600	 5"	 108"
XS-1691 69	 8,640	 8,640	 5"	 120"